SOLD! But if you want one, I can custom make one. Please let me know. This is a handmade journal, perfect for a travel diary, sketchbook, illustrated journal, or guest book. 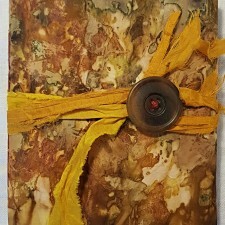 The cover is handdyed with purple and yellow onion skins in an eco-print technique. 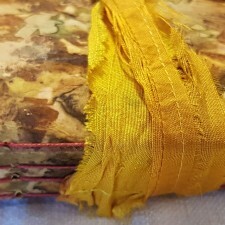 The cover folds over and fastens with a vintage horn button and marigold sari silk. (If you prefer twine, let me know.) the inside cover has a pocket and comes with four, single cardsized sheets. 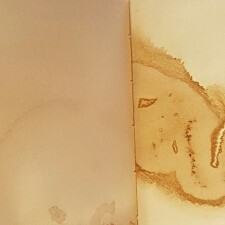 The pages are Fabriano paper, 200 gsm, perfect for watercolour. 40 pages for 80 sides. 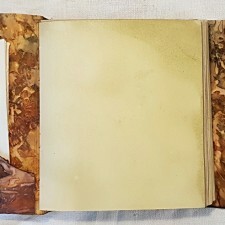 Measures 7″ x 7 1.2″ (17.5 cm x 19 cm) Pages are all handdyed with tea, coffee, or avocado skin plant dye. It is a dramatic piece and sure to get attention, as well as a very useful size.